In a country, surrounded by enemies and under constant threat, it is a relief to worry about the weather. The news reporters spread out across the country, giving constant updates. This time they spoke of weather damage, not missiles. What a relief. In Israel people pray for rain. We have experienced years of drought which has a negative effect on fruits and vegetables grown here, everyone’s water bill and the country’s ecosystem. When we suddenly experience too MUCH rain, even though much damage was caused, the general reaction is one of relief. A storm can only last a few days here. Hunker down, pick up the pieces when it’s over and most likely, we will be free of storm damage for a number of years to come. Time, patience and renewal will heal all the damage. Too bad it’s not so easy to overcome the ‘storms’ of violence and terrorism. 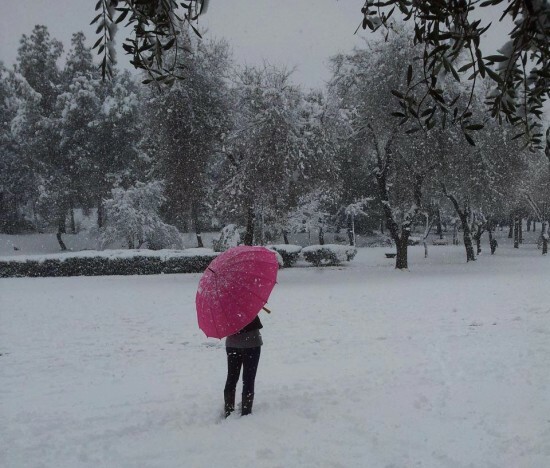 One more thing granted Israelis patience with the weather – the hope of snow. The media weather people told us that the possibility of snow was very high. Real, fluffy snow (rather than ice or sleet) is very rare in Israel. Grownups were just as excited as Israel’s kids. Some people waited through the night, in anticipation of the promised snow. And it happened – for one day the City of Gold was painted white. Snow fell in Jerusalem, in northern Israel, Mount Hermon and even in a few places in southern Israel. Everywhere it snowed school was cancelled. Not so much because it was too difficult to travel but because it was a time kids should be playing outside. Many grownups stayed home to play with their kids instead of going to work. For one day Israelis had the opportunity to relax and pretend that we live in a normal country. For a few days we imagined what it would be like to live in a place where the weather was the most important news, the biggest worry. As a child I remember the snow storms of Detroit. What we experienced this week in Israel was not really snow. It was more the hope of snow; the anticipation and the pleasure at something simple. I’m not sure what people enjoyed more – the snow or the opportunity to pretend that we live someplace normal, someplace where there is nothing to worry about but the weather.